"Yawns will be gone from the breakfast table when you serve Jo Groth's strudel. 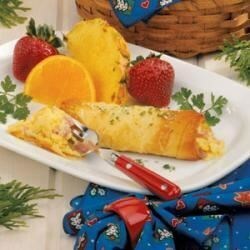 The Plainfield, Iowa cook wraps phyllo dough around a creamy filling of ham, cheese and egg substitute to create pretty golden-brown roll-ups that taste terrific!" In a saucepan, melt butter. Stir in flour until smooth. Gradually stir in milk. Bring to a boil; cook and stir for 1-2 minutes or until thickened. Add ham; heat through. Remove from heat. Stir in Swiss cheese and 2 tablespoons Parmesan cheese until Swiss is melted; set aside. In a nonstick skillet coated with nonstick cooking spray, cook and stir egg substitute over medium heat until completely set. Stir into cheese mixture. For each strudel, place one sheet of phyllo dough on work surface with a short side facing you (keep remaining dough covered with waxed paper to avoid drying out). Coat dough with nonstick cooking spray; fold in half lengthwise. Coat with nonstick cooking spray; spritz with butter-flavored spray. Sprinkle with 2 teaspoons bread crumbs. Spread some egg mixture over bottom third of dough to within 3/4 in. of bottom and sides. Fold in sides. Roll up dough, starting at end with egg mixture. Place seam side down on an ungreased baking sheet. Coat with nonstick cooking spray; spritz with butter-flavored spray. Bake at 375 degrees F for 15-18 minutes or until golden brown and filling is heated through (filling may expand and come out of dough during baking). Sprinkle each with parsley and remaining Parmesan cheese. This recipe was tested with I Can't Believe It's Not Butter Spray. Nutritional Analysis: One serving equals 218 calories, 8 g fat (3 g saturated fat), 18 mg cholesterol, 576 mg sodium, 18 g carbohydrate, 1 g fiber, 18 g protein. Diabetic Exchanges: 2 lean meat, 1 starch, 1/2 fat. A hit, my friends loved it!!!! Delicious recipe, the only thing I did different was that I used cheddar instead of Swiss and skip the bread crumbs. This is awesome, made as written except with shredded colby, Monterrey jack as did not have Swiss. Everyone raved about this! Used 6 eggs, scrambled. Made sauce with sauteed shallots and omitted the bread crumbs. I am supposed to make this again. Delicious! I doubled the ham and swiss and was able to get 14 servings instead of 6. Otherwise, I followed the recipe exactly except that I omitted the breadcrumbs...it was SOOOOOO good!